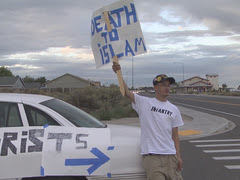 A 28-year-old man holding up a sign that read “Death to Islam” is creating some controversy in the community. Michael Harmon was standing on the side of the road in West Richland, across the street from the Islamic Center of Tri-Cities yesterday. “Taliban, ISIS, Al-Queda, they all follow the Quran and the Quran is absolutely evil,” said Harmon. He went on to say he’s completely fed up with terrorists and decided to picket across the street from the only mosque in town. This sign on his car read “Terrorists” with an arrow pointing to those across the street. Jim Jewell was driving by and pulled his car over and started yelling at Harmon, calling him ignorant and a moron. Jewell said he’s offended and said the words, “Death to Islam,” are a threat.